FABB encourages members and other interested residents in the Tysons and McLean areas to attend a Virginia Department of Transportation (VDOT) public hearing on the project to connect Rt. 123 and Tysons Corner Center. The meeting will be on Thursday, June 14, from 7:00 to 9:00 p.m. at the George C. Marshall High School, 7731 Leesburg Pike, in Falls Church. Based on the results of the preliminary engineering phase of the study, which included earlier public outreach meetings, the final design plans include a 10’ shared-use path along Old Meadow Road from the McLean Metro Station leading to a pedestrian/bicycle bridge over I-495 to connect to Tysons One place and Fashion Boulevard. This $6.2 million project is tentatively scheduled to begin and be completed in 2020. This will be great opportunity to speak up in favor of much needed bike improvements and show state and transportation officials the strength of county residents’ support for multimodal transportation options. If unable to attend, you can also email comments to meetingcomments@VDOT.virginia.gov. 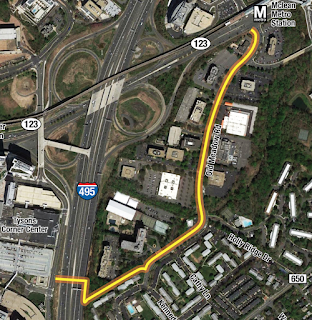 Please reference “Tysons/Old Meadow Road Bike/Ped Improvements” in the subject line.